The next stop for partypoker MILLIONS LIVE is Sochi, Russia. The first partypoker MILLIONS LIVE event in the post-World Series of Poker calendar portion of the year goes to Sochi, Russia. 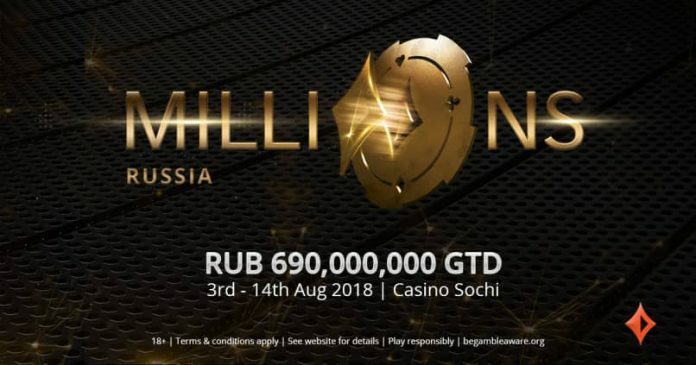 690m in Rubles ($10.95m USD) is guaranteed to the series prize pools that includes a 300m RUB ($4.75m USD) guaranteed Main Event. A total of 13 events are on the schedule with buy-ins ranging from 66,000 RUB up to 6 million RUB. Dmitry Chop won the first edition of the partypoker MILLIONS in Russia. The $1,100 USD event attracted 1,170 entries to break the $1 million USD guarantee and Chop took home the largest percentage of the prize pool thanks to his $225,000 victory. partypoker’s tradition of online and live flights for their Main Events holds to form in Russia. Three live Day 1s and an online Day 1 on August 5 dot the schedule. Live Day 1A starts on August 7 and plays for eight 60-minute levels with the traditional starting stack of 1 million chips. Players are incentivized to use PP LIVE $$$ to buy-in into the Main Event. Any player who enters using that method among the first 100 is entered into a last longer funded by partypoker. The final player standing among those who enter using PP LIVE $$$ wins an additional $100,000 on top of their original payout. Other primary events on the schedule include the 66,000 RUB partypoker Open, 3 million RUB Triton High Roller and the 6 million RUB Triton Super High Roller. Triton is currently in Jeju, South Korea for the latest edition of the Triton Super High Roller Series. Short Deck poker is sweeping the poker world thanks to the use in the Triton Series. No news is available yet on whether or not the Triton events in Sochi will use the popular format. The full series runs from August 3 until August 14.